It may seem like there are a lot more choices than ever before for finding a good airport parking service in SeaTac. You could park it yourself, stay at a hotel, take a shuttle, find a limo, or even take a cab. However, these choices all leave something to be desired. When you want ease of use and easy access to your vehicle using any SeaTac airport parking lot just isn’t going to cut it. MVP Airport Parking and its valet parking team are ready to provide you with the best service and the best parking experience available for your vehicle. Traveling often combines many emotions. The excitement of going someplace new is always accompanied by the fear of leaving the known. Even if you are flying to a familiar place, you may experience some anxiety. There is no reason why you should have any anxiety about leaving your vehicle behind. When you fly out of Sea-Tac, WA, you will most likely need a place to keep your vehicle. While an airport parking lot can seem like a hassle at best and unsafe at worst, there is a better alternative. MVP Airport Parking service will provide you with a safe place to keep your car. 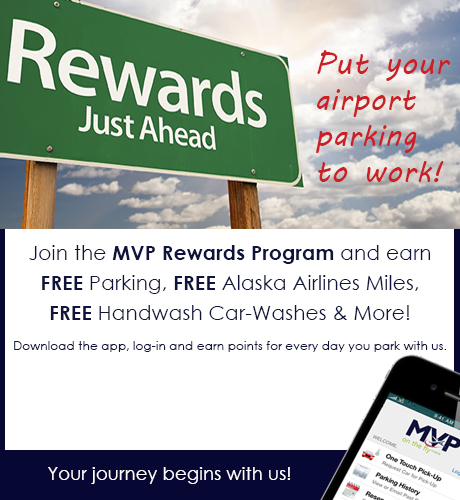 MVP Airport Parking has been a leader in the Sea-Tac airport parking community for 20 years. With our signature valet parking service, including over-sized vehicle and long-term parking, MVP Rewards Program and the MVP mobile app, “On the Fly”, we take your airport parking experience to the next level. Coordinating what to do with your vehicle when you fly can feel like just one more inconvenience to have to manage. Fortunately, MVP Airport Parking takes the headache out of the equation. We can park your car for you, letting you get to where you need to go faster. It’s easy to keep in touch through our app via messaging, so you can always let us know when you’re ready to drop your car off. One of our valets will make sure your car is safely and securely stored while you’re away. Let us help you take the stress out of ride coordinating when you fly so that you can spend more time on what shoes to bring or whether or not you’ve polished that presentation. Try us once and you’ll never want to choose any other vehicle storage system when you travel. The chaos of Seattle airport parking just got simplified. Whether you travel for business or pleasure, your journey begins here. Book now!